View from the south-east of the Jami Masjid, Bijapur. bl.uk > Online Gallery Home	> Online exhibitions	> Asia, Pacific and Africa Collections	> View from the south-east of the Jami Masjid, Bijapur. 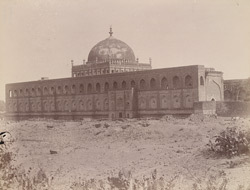 Photograph of the Jami masjid, Bijapur from the Archaeological Survey of India Collections, taken by Henry Cousens in the 1880s. The Adil Shahi dynasty ruled parts of southern India from the late 15th to the late 17th centuries, with their capital in Bijapur. The dynasty was founded by the governor of Bijapur, Yusuf Adil Shah, of Persian origin, who broke away from the declining Bahmani kingdom of the Deccan. The rulers of the Adil Shahi dynasty were great patrons of art and architecture.With Mughal rule expanding to the Deccan, Bijapur was no longer able to evade confrontation with the Mughals and fell to Aurangzeb, after which its importance faded. The Jami Masjid was commenced in the late 16th century by Ali Adil Shah (r.1558-80), but was never finished. It is the largest mosque of Bijapur, with arcaded sides and a large courtyard with a reservoir in the centre. The prayer hall has a facade of nine bays and is crowned by an elegant, well-proportioned dome. The interior of the mosque has minimal decorative elements. In 1636 Muhammad Adil Shah (r.1627-1656) added the gilding and inscriptions of Persian verses on the mihrab. The floor of the prayer halll was divided into 2,250 rectangular inlays that resemble prayer rugs on the orders of Mughal Emperor Aurangzeb (r. 1658-1707).